Whoever did the snow dances, thanks. In my last posts about snowpack and likely summer streamflow, we were looking at a snowpack ranging from 69% to 93% of normal, with the most important basins at 81-86% of normal and falling fast, with most of the snow having fallen before early December. We were also dealing with drastically above normal temperatures that left the snowpack warm rather than deep-frozen as it usually is from early December through mid-January. If those conditions had continued, we would have been looking at a drastically below normal snowpack, an early runoff, and probably some tough fishing and perhaps closures in August. Thankfully, Old Man Winter finally woke up and the past few weeks have reversed the previous trends. Several big storm cycles have hit that have raised the snowpack to near-normal levels in most of our operations area. In addition, Late January and the first few days of February have been bitter cold. Typically we’re past the worst of winter by now as far as cold (though not snow), but the past few nights have seen temperatures well below zero. In addition, this overall cold/wet trend is forecast to continue through at least the middle of February, and perhaps through most of the month. That will still leave a lot of winter and spring to go, but it will put us in a much better position overall. The improvement should be pretty obvious. Put simply, we’re looking at a strong probability of cold/wet conditions through at least February 20. February is typically a drier month than either January or March, so having it run wet instead can really help the snowpack add up. Disclaimer: Everything I say from here on out depends on near-normal weather from now through early June! What Does the Above Mean for Summer Streamflows? I do feel safe making the following prediction: We are unlikely to have either substantially high summer streamflows or drastically low streamflows from late June through early September. I suspect we’ll turn out with something like an 80% to 110% snowpack and streamflow this summer, with around 90% of normal my guess. What Does This Mean for the Fishing, in General? Generally speaking, low snowpack means better conditions and fishing from the middle of June through the middle of July, with an early start on our primary summer fisheries on the Yellowstone River and its tributaries, but worse conditions from the beginning of August through the middle of September on these waters as well as limited fishing on our secondary waters, the Madison drainage in YNP and the lower Madison River, the Boulder River, and the Jefferson River. Higher than normal snowpack means tougher conditions and fewer places to fish in the first half of June (though good fishing in the places that are low enough and clear enough, mainly the Firehole, Gibbon, and Lower Madison Rivers, as well as private lakes), but much better conditions and fishing from late July through the middle of September in the Yellowstone System. All in all, we would rather have normal to slightly high snowpack with the Yellowstone drainage falling into shape in the first or second week of July depending on location, with good conditions in August, but have to sweat things a bit in June. I think we’ll be ABOUT there this season, with only a couple weeks in early August in which water temperatures might make late afternoon fishing a tough option and slightly tougher fish in late August and early September, the latter due to low water and weeds rather than water temperature issues. Overall, I anticipate conditions and fishing resembling the following recent seasons: 2009, 2010, and 2017. I do not expect low/warm/challenging conditions as found in 2012, 2013, 2015, or 2016. Nor do I expect the high water and late start we had in 2008 or 2011. I also expect the conditions to be slightly less favorable than the “perfect” years we had in 2014 and 2018. Any July-August River Closures Likely? July-August closures are likely on the waters within our operations area on which such closures are typical, namely the Jefferson and lower Madison Rivers. The lower Madison will probably not be worth fishing from June 25 or so through about Labor Day. The Jeff will probably hold on a week or two longer at the front end and start a week earlier at the back end. In addition, the Firehole, Gibbon, and Madison within YNP will be too warm from sometime in late June (Firehole and Gibbon) or early July (Madison) through late August (Madison) or early September (Gibbon and Firehole), though they are seldom closed. I do not expect any closures on the Yellowstone River, the Lamar River or its tributaries, the Gardner River, the Boulder River, or the Stillwater River. In other words, all of our summer waters should be fine and should not experience any closures, though as always the hottest/brightest days in late July and early August may necessitate an early start or quitting early for the best fishing, and the hottest/brightest days in late August and early September may necessitate either floating the roughest/deepest water or accepting spooky fish. This is typical even in high water years. As I noted above, all of this might change somewhat depending on snow that hasn’t fallen yet as well as when runoff begins. When Will the Best Fishing Occur on Various Waters? Take the below with a massive grain of salt. I will be able to refine the following dates and make them more and more accurate as the winter and early spring progress. Waters are listed by jurisdiction, Yellowstone Park followed by Montana, with the waters listed within each jurisdiction according to rough overall importance to Parks’ Fly Shop’s guide services rather than distance or the number of shop customers who aren’t being guided headed to these waters. Note:The general park season runs from sunrise on May 25 through sunset on November 3 this year. The major exception to the general dates is the Yellowstone River system upstream from the Upper Falls, which primarily opens July 15 (the lake opens with the general season). The best fishing from the lake to the falls will as usual occur from the July 15 opener through July. This year should see good water conditions for this period, neither too high nor too low. Since fish numbers are on the upswing, I anticipate the best fishing since the late 1990s on this water this season. How’s that for a prediction? The best fishing in the Grand Canyon (Silver Cord Cascade to Lamar River confluence) will occur from about June 20-25 through September, with only crowded and/or hot-sunny days in August and early September likely to be a bit slow, especially when the Lamar and its tributaries are muddy, which tends to push people here. There will be no water temperature issues. Expect Salmonflies to begin sometime between June 20 and July 1 and last through about July 20. The best fishing in the Black Canyon (Lamar confluence to the park boundary at the Gardner River confluence) will occur from about July 1 through early October, with hot/sunny afternoons in early August likely a bit slower due to warmer water temperatures than we like. As always, this water can get muddy after summer thunderstorms. Expect Salmonflies in the lower end of the canyon between June 25 and July 10 and in the upper end from July 1 through July 20, with those dates to be refined later. Yellowstone River tributary creeks inside the park will generally fish best in July and August, as always, though a couple will be fishable by June 10-15. Cascade Lake should be accessible between June 5-10 and fish best through early July. The upper Gardner, between its headwaters near Emigrant Peak downstream to Osprey Falls, including all tributaries in this section, will probably not be fishable at all in 2019. This is due to the ongoing Norris to Golden Gate road construction project. This project has been marching steadily northward for the past few seasons, and has already impacted some areas in the upper Gardner (especially Grizzly Lake and Winter Creek). We expect this project to extend north either to Indian Creek Campground or even all the way to the Golden Gate (the steep little canyon with the waterfall south of Mammoth) this year, making access impossible. Keep an eye on the blog for updates, which we will get in late spring. The middle Gardner, between Osprey Falls and Boiling River, should be clear enough to fish on a day-to-day basis from the beginning of the park season, but very cold at that time. It will come on for real sometime in the last week of June, most likely, and remain good throughout the remainder of the park season except on exceptionally cold days in October-November. October is always the absolute best time to fish here. The lower Gardner, between Boiling River and the Yellowstone confluence, will be fishable on a day-to-day basis from the beginning of the park season, and might be low enough by the 10th or 15th to be very good at least for fit anglers who can handle the fast water and like fishing stonefly nymphs. The fishing will really kick into gear after June 20, with the Salmonflies soon after. The last week or so of July and first half of August may see high water temperatures in the afternoons on warmer days, and I expect heavy weed growth to make nymphing annoying in August and September (the weeds have been getting worse and worse every year). The fishing will remain good through the close of the park season, and as always October is the best time to fish here at least if you’re looking for large fish and/or dry fly fishing (runner browns and BWO hatches, respectively). Lower Gardner Tributaries, basically meaning Lava Creek, will be fishable sometime in the latter half of June and be best in July and August. The Firehole should be prime on the park opener and remain good through at least June 20, with afternoon fishing tough on bright days no later than June 15. The Firehole will probably be too warm for the summer by July 1, though its tributaries can be good through the summer. It will turn on again after Labor Day and remain good through the close of the season. The Gibbon River Canyon might be ready with the park opener, but is more likely to drop and clear enough to be good sometime between June 1 and June 5. Norris Meadow, Elk Park, and Gibbon Meadows should be low enough to fish well by June 10-15. While Norris Meadow (and the small fish water up to Virginia Cascades) can fish okay for mostly smaller trout through the summer, the stretch from Elk Park down to Madison Junction will be too warm from sometime in late June or early July through about Labor Day. Reminder: the water from Grebe Lake to Virginia Cascades was poisoned in 2017 and is fishless pending grayling and westslope cutthroat introductions. The Upper Madison might be ready with the park opener, but is more likely to drop into shape for nymph and streamer fishing between the opener and June 1, with the best dry fly fishing from June 5 through June 20. It will get too warm for the summer except during cool spells beginning sometime in the last few days of June or the first few days of July, extending until late August. It will then be good through the close of the park season, with the best big trout opportunities in the latter half of October. All will probably drop into shape in the first week of July and be best from mid-July through early August, then get steadily harder and harder until they get too cold in late September or early October. As usual, crowds will be overwhelming and will detract from the experience in the roadside sections of Soda Butte and the Lamar. Those who can do so should stick to the rugged portions of the Lamar, hike to the Second Meadow on Slough, head over to the Yellowstone instead, or hike up one of the small tributary streams. For what it’s worth, in 2018 we ran ten or twelve ten trips in the Lamar Drainage, total, and about half of those were on rugged stretches that aren’t the pretty roadside meadows most anglers think of when they envision this drainage. This water is just too crowded for us to want to take most clients here, these days. People don’t pay us for combat fishing for scarred and lethargic fish that get caught twenty or thirty times each season. As soon as the current cold snap breaks, most of the Yellowstone will become fishable on foot through early May. The best spring fishing will occur from late March through April. If you’ve never fished the Yellowstone in the spring, it’s uncrowded and an excellent time to target larger fish using subsurface tactics. Runoff is likely to begin (as always) sometime in the first or second week of May, though in 2018 it actually started in April. This will put the entire river out of play for a month to six weeks, probably closer to the latter. The Upper Yellowstone, from Gardiner to Carbella, will drop into good shape in the last week of June if current conditions hold, with the Salmonfly hatch at the same time or beginning less than a week later. The fishing for the hatch should be good, with lower water levels than we saw in 2017-2018. The most consistent fishing overall will occur in July, but water levels should be good enough that the fishing should be at least decent most days through October. The hottest, brightest periods in the last week of July and first half of August might entail meeting and taking out early, while the fish might be spooky during hot/bright weather in late August and early September. I do not anticipate any streamflow or water temperature issues beyond perhaps a few slow afternoons. Now that I (Walter) use a raft rather than a drift boat, Yankee Jim Canyon will be floatable during this entire period, though it is best when water levels are below 5000cfs, probably from about July 15-20 onwards. For what it’s worth, I guided this water in late October at flows of 1000cfs in 2018, for the first time, and the fishing for big rainbows on dead-drifted streamers, BWO nymphs, and egg patterns (near brown trout spawning areas) was phenomenal. Paradise Valley (Carbella to Livingston) will drop into shape at the same time as the upper Yellowstone, and may or may not experience a good Salmonfly hatch. If the hatch pops as the water clears, levels should be right for a few days of very good fishing with both dries and subsurface bugs (including streamers!). After that, there will be a small dip in fishing quality before things get good again by the 10th-15th of July. Levels should promote good fishing through all of Paradise Valley through early August, but 26-Mile to Mallard’s Rest might be a bit slow from early August through mid-September, due mostly to low water levels rather than temperature. This will depend on weather conditions, with cool/cloudy days best in late summer and early fall. The upper and lower valley (Carbella-26 and below Mallard’s) should fish like the Upper Yellowstone does in this period. The whole valley will come back into play regardless of weather after September 10 and be good thereafter. The Town Section through Livingston will come into play in early July and be good from that point through October except during the hottest, brightest days in August. Now that I (Walter) live in Livingston, along with Rob Olson and many of our contractor guides, we expect to fish this water a lot more. It’s good for both numbers of 12-14″ rainbows and decent shots at big browns, and it’s amazing how little of Livingston you actually see. 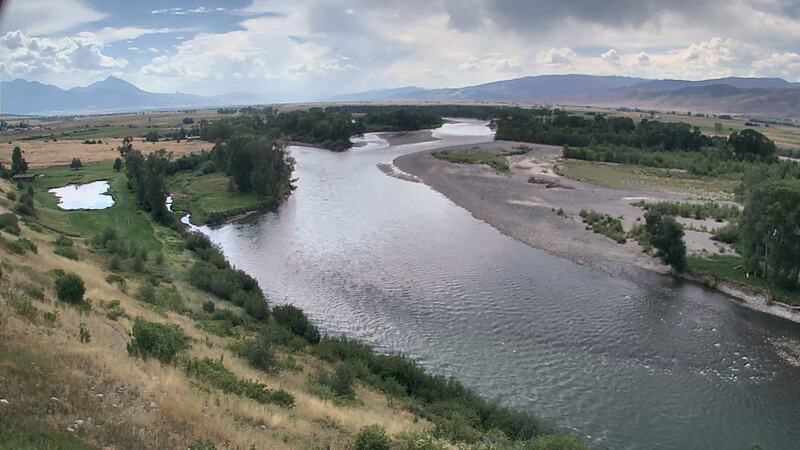 The Lower Yellowstone (Livingston to Big Timber and Beyond) will come into play sometime between July 5 and July 15 and will fish best during cooler/cloudier weather in August (hoppers) or in a general sense in September and early October. This is “rowdier” water than the stretches of the Yellowstone upstream, and holds fewer but larger fish, so it is a much tougher option during the otherwise great period of July. The private lakes will be best from ice-out in early April through the middle of June (Story) to the middle of July (Burns), and good options again from the middle of September through late October. Since all of our guides who guide on Burns now live in Livingston, we have deleted our Burns Lake fuel fee, making this lake a great option for early summer dry fly fishing provided the wind isn’t howling. Burns and Story both fished well in 2018. Merrell Lake experienced another fish kill in 2018, after one in late 2017, so we will not be guiding on it this year (and suggest you avoid it for your own fishing, as well). We will be offering trips on this river for the first time in 2019. It is only floatable for a short window after the spring melt. This year, it will drop into shape between June 25 and July 1 and remain floatable for 4-6 weeks. This is a great attractor dry/dropper river that typically produces larger fish than the upper Yellowstone does with similar tactics, on average. The Lower Madison is the closest float option to Gardiner during the May-June period. Since Rob Olson and I are now based in Livingston, we have dropped our fuel fees for this water, so if you’re willing to meet us in Livingston, day-trip river floats are now available even during the Yellowstone’s spring melt. This stretch of the Madison begins at Warm Springs Access and extends to Three Forks, though the best trout water ends at Greycliff. It is best in the latter half of May and the first half of June, will get too warm sometime in the latter half of June, and turns on again sometime around Labor Day, with good fishing in late September and October. Limited opportunities for carp and pike are possible during the warm water period in high summer, but there are better fisheries. The trout water below Holter Dam is good all year except perhaps during August and early September, but we only guide it in spring and early summer. It requires a 2+ day commitment. Expect good levels for nymphing in May and June, but the water may be too high for good dry fly fishing from early May through early June. We’ll see how much more it snows. Contact me for details on the floats we’re offering for the first time on this stretch. The multispecies water between Toston Dam and Canyon Ferry Lake is always best in August and early September, especially on hot/bright days when other options might be poor. While some walleye, pike, and big (20+ inch) rainbows are possible at this time, we’re mostly sight-fishing for “rocky mountain bonefish,” aka carp. Don’t knock it til you’ve tried it. We’re talking about 4-12lb fish that require careful presentations and often run over 100 feet, without any crowds. Curious? This water also provides some options for big run-up browns in October and November, though we seldom fish it then. The “Land of the Giants” section produces well from now through July whenever it’s warm enough you can stand it. The heaviest crowds are from mid-April through mid-May. We WILL NOT be guiding this water in 2019. I had to sell my jet boat to make a down payment on a house. I expect to replace the boat and resume offering trips here in March, 2020. We expect to the spring creeks to be a much more important part of our business this year, since we now have two full-time guides based in Livingston. As always, the creeks are best from now (early February) through April, from about June 25 through about July 20, and from mid-October through fall. We would love to introduce you to these waters in March or April. We will be offering trips on this river for the first time in 2019. It is typically best in the latter half of April and early May, before runoff, for a week or so right after runoff (this year the last week of June or first week of July), and again from the middle of September onward. It’s a long way from Gardiner, but doable as a day trip, and a “different” river than most you’ll see. Richard Parks last guided here in the early 1980s, but we’ll be offering trips here again staring in fall 2019. This is big fish hunting downstream of the East Gallatin confluence in October, for run-up fish out of the Missouri. The Upper Gallatin, from the Yellowstone Park boundary down to Four Corners, is always good in late March, April, and July, with lower portions tough in August and early September. We don’t really guide this water, though. Expect details on the Shields, East Gallatin, Darlington Ditch, Stillwater, and a few other waters that are secondary options at best by late spring.